For three sweltering months this summer, Lauren Replogle called the Naval Oceanographic Office home. 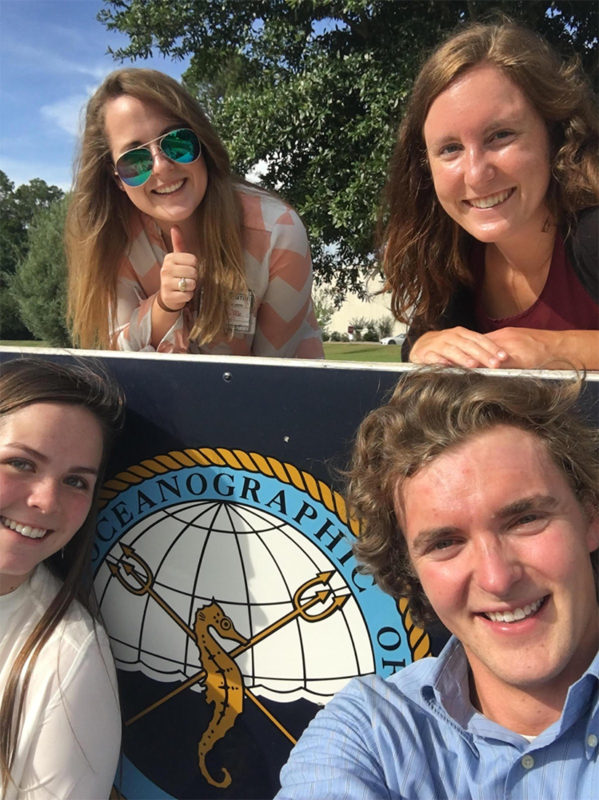 A Texas A&M Department of Oceanography graduate student, Replogle worked in the oceanographic office, which plays a role in ocean forecasting and protecting U.S. assets and personnel, through an internship with the United States Navy in Mississippi. Scientists within the department run and maintain the ocean models, collect and quality-control ocean observing data sets, and prepare forecasting products that align with the Navy’s mission objectives. “They also develop and maintain data basis of oceanographic observations and collect observations on oceanographic service ships that deploy oceanographic sensing devices such as gliders, profiling floats and buoys,” she explained. As a student in the Science, Mathematics, And Research for Transformation Defense Scholarship for Service Program (SMART), a STEM-focused Department of Defense program for undergraduate and graduate students, an internship was a requirement for Replogle. She was introduced to the program simply by walking the halls of the O&M Building, seeing a bulletin-board flyer and then consulting with Dr. Don Conlee, an Atmospheric Sciences professor, about the opportunity. Students apply for the program just as they would any other scholarship. Although two years are required, Replogle plans to continue working there after those are over. “It's something that I really enjoy and it makes me feel like I am contributing to society and the protection of the country through the same goal as the military,” she said. Replogle graduated in 2016 with a bachelor’s of science in meteorology, with a minor in oceanography, from Texas A&M. Her undergraduate education helped her this summer, she said. Top: Lauren Replogle, Texas A&M University; Malarie O’Brien, Coastal Carolina University. Bottom: Katie David, Tulane University; Patrick Saylor, Dartmouth University. Photo courtesy of the U.S. Navy.